Last week I looked at the distance race results of some skiers who had been caught using performance enhancing drugs. 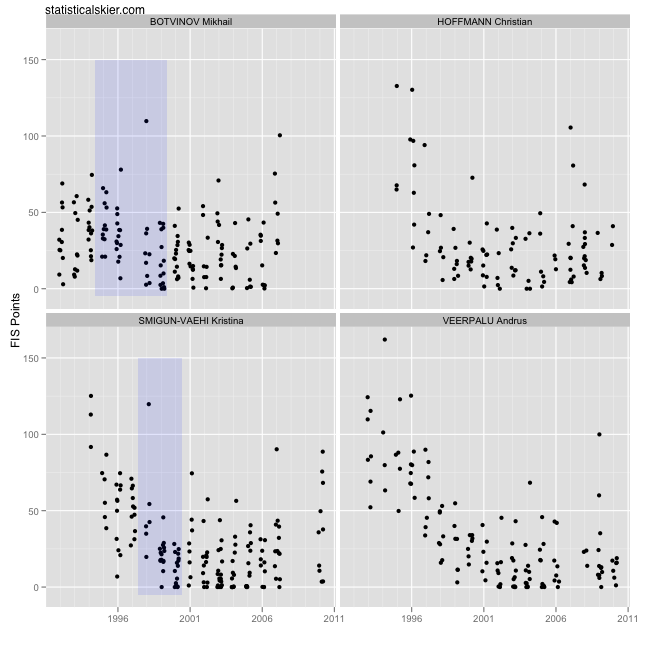 A commenter wondered if I could show some data for “suspected dopers” as well. Honestly, I was a bit reluctant to do that. I mean, as much as I hate doping, the negative consequences of being labelled one are enough that I think we should be pretty careful about throwing accusations around, particularly in public. In the end, though, I think we can do this responsibly by being very careful to remember that the only certain way to catch dopers is in the act (and even then it can get ambiguous). I sort of hope that this exercise will reinforce the lesson from my last doping post that looking for evidence of funny business using graphs of race results is highly unreliable. Along with my commenter’s suggestions of Andrus Veerpalu and Christian Hoffman, Kristina Smigun-Vaehi and Mikhail Botvinov were suggested to me as skiers who might be considered “suspicious” within the skiing community. As before, I’ve highlighted sections of careers that might conceivably be considered suspicious. Botvinov had been racing since 1990, so I’m actually only missing 1-2 seasons from him. He appeared to have been slowing down somewhat until making a modest improvement in 1995-1996. Then he defected to Austria and had to sit out several seasons until his citizenship issues were worked out. When he started skiing again, he was quite a bit faster. Smigun-Vaehi appears to have made a big jump between the 1997-1998 and 1998-1999 seasons. The gap later in her career came when she had a child and took some time off. Veerpalu and Hoffmann on the other hand don’t have anything that particularly stands out, at least to my eye. I suppose Hoffmann got fast pretty quick, but we don’t have much of a record prior to 1996 for him, so it’s hard to read much into that. In the end, I don’t think we learn much from these kinds of things. It’s easy to look back at people we know cheated and find little things that seem suspicious. But as I’ve said before, you can’t just assume that people who make big jumps are doping. Sometimes people just get faster. There are tons of skiers who’ve made big “suspicious” looking jumps who no one would think is doping. In these particular cases, Botvinov and Hoffman actually came awfully close to being “officially” caught in 2002 but were eventually cleared by the IOC. In any case, I sure as hellam not going to call one of my little graphs anything close to “evidence” for doping. Posted by Joran on Friday, June 25, 2010, at 3:07 pm. Filed under Uncategorized. Tagged doping. Follow any responses to this post with its comments RSS feed. You can post a comment or trackback from your blog.